Our bedroom is west facing because of which the sunbeam penetrates our room towards the afternoon, which by the way rankles me a lot for though I don't sleep in the afternoon usually but sometimes while reading a book when the eyes feel heavy and I yearn for a nap, the heat of the sunlight forces me to remain awake, totally putting me out. Thanks to my engagement with an interesting book over the last week, I have taken to the habit of sleeping late but since hubby dear wakes up early in the morning for office; I too get up early keeping things ready for him. Because of the deprivation of required hours of sleep, I have begun to feel drowsy in the afternoon, but the bedroom blazing with sunlight interferes with my siesta and I snarl mutely in frustration. Now I know an amazing way to channelize frustration into something positive. 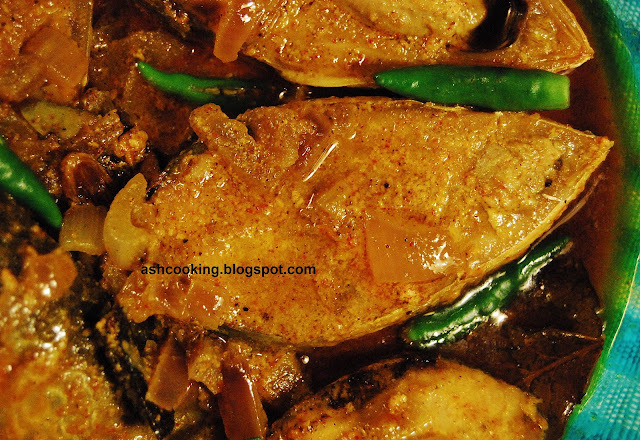 So there I go writing a recipe of a fish curry I cooked few weeks back. 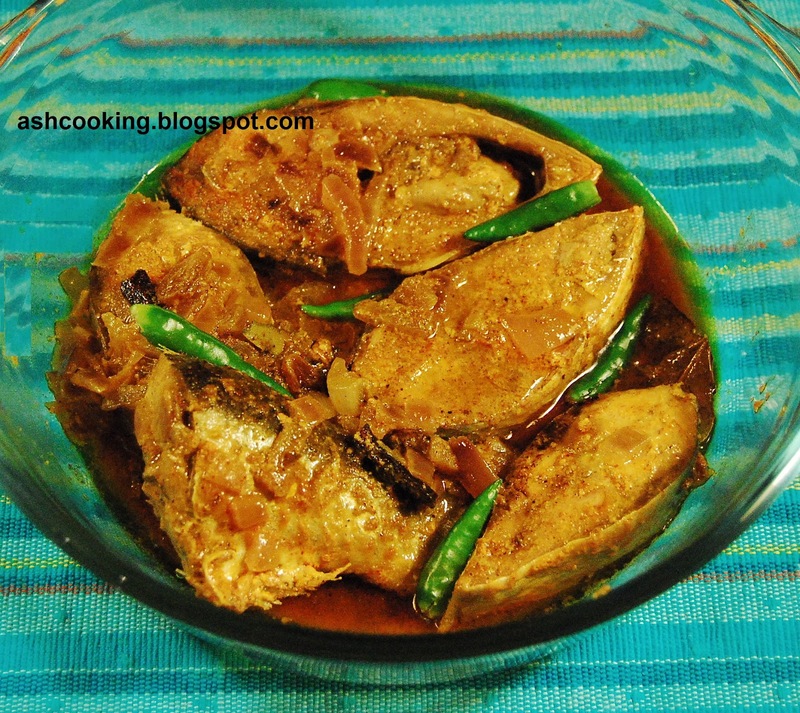 This Hilsa preparation needs generous amount of mustard oil, any addition of water might dilute the effect. So if you eat counting calories, this dish might not be what you are looking for, but taste wise, it is mouthwatering, completely singular in flavor. 1) Marinate the fishes with yogurt, turmeric powder, cumin powder, kashmiri red mirch, salt and mustard oil. 2) Heat generous amount of mustard oil and when oil turns hot, add the ingredients for sauté allowing them crackle. 3) Toss sugar into the oil and add onion. Fry till onion changes color. 5) Add ghee and garnish with green chillies. 6) Serve hot with rice or pulao.